ViewSPORT ink is completely invisible until it comes into contact with moisture from water or sweat. Sometimes called a reveal ink, designs printed with water-activated ink are only visible when the fabric is wet. When the garment dries, your design disappears, ready to start the cycle all over again. As with many specialty inks - glitter, metallic, and glow in the dark - water-activated ink brings a unique and attention-grabbing element to your custom apparel. 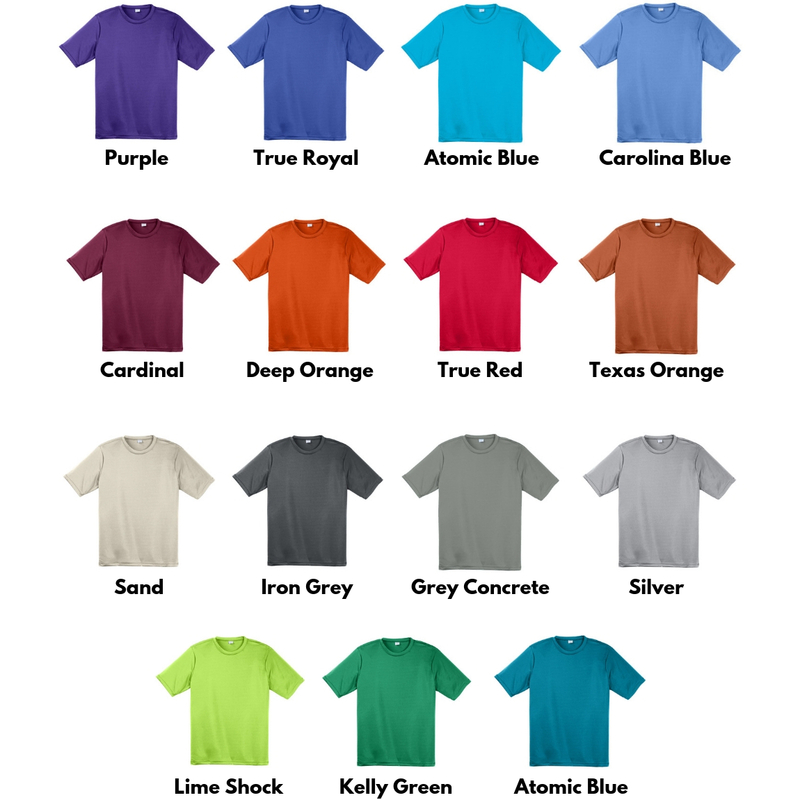 Polyester is the optimal fabric for water-activated ink, and a standard choice for athletic apparel as well. It’s light-weight, quick drying and durable enough to withstand washing without breaking down or shrinking - everything you’d want from the perfect workout gear. Designing with water-activated ink is all about high contrast. As the rest of the garment darkens with moisture, your design will remain the color of the dry fabric. Because of this, color choice is key. You’ll want a garment that’s a good middle ground between too dark and too light. Some of our favorites are cardinal, iron and concrete grey, carolina and atomic blue, kelly green and lime shock but tons of available colors will give your viewSPORT ink a high impact reveal. A sales rep can help you select the proper shade. Because this ink is water-activated, the most effective placement will be the areas where the most moisture is produced: the back, between the shoulders, the chest and the stomach. A full top to bottom repeated message is a great way to cover your bases, since everyone sweats a bit differently. Keep placement in mind while you’re creating your design. If you’re set on including an unconventional location like a sleeve print, you might want to consider using an additional type of ink. Consider combining your water-activated design with an element printed in a standard ink, like plastisol. Plastisol lends itself to precise color matching, which means you can replicate your logo or design perfectly - and your brand will be visible even before the work-out begins. Using multiple inks is also an interesting way to reveal a word or phrase that completes a sentence, or adds a motivational twist to a common phrase. Let’s get a bit conceptual here. 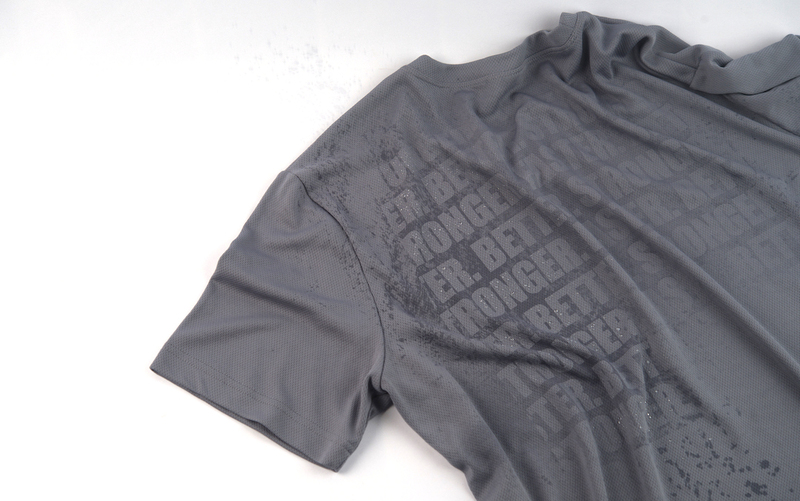 You’re choosing a phrase that will appear after someone’s been sweating it out in their workout. What do you want them to see? A motivational phrase that will keep them pushing to the limit? An encouraging slogan that lets them know they’ve accomplished something great? Use a single sentence for an impactful punch, or a word-cloud that will look great from far away and offer inspiration up-close. You don’t have to limit yourself to writing, though. Water-activated ink can reveal an image or a pattern as well.